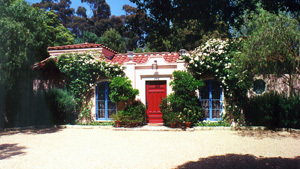 Montecito real estate — live a luxurious lifestyle in "America's Riviera" — glorious Santa Barbara. Grand estates, stunning ocean and mountain views, and a mild sunny climate all come together to make this Pacific coastal community irresistible. Historic elegance, lush countryside, and spectacular ocean vistas contribute to the enormous appeal of Montecito real estate. Montecito is a small community 90 miles up the coast from Los Angeles, framed by coastal mountains and broad, white beaches. White Mediterranean homes with red tile roofs, bougainvillea covered stone walls, wrought-iron gates, palm lined drives, courtyard cafes, collectable cars and smart boutiques, all mixed with a casual but refined lifestyle, characterize Montecito. This is the perfect place to raise a family, where the weather is ideal, the air clean and the schools, beaches and parks are healthy, enjoyable environments - the ideal retirement spot, a place rich with leisure and recreational pursuits. Most new residents are first introduced to our community while on holiday, as was the case many years ago when wealthy Eastern families discovered Montecito in the late 1800's. Huge estates were created as wintering spots, and by the 1920's there were more millionaires per acre in Montecito than anywhere else in our country. Today these fine homes are being renovated with the care they deserve, and some of our most charming small homes started their lives at the turn of the century as modest gardener's cottages to these estates. Our Montecito real estate is more than enchanting: the magnetism of this quiet coastal community is absolutely intoxicating. Like an island where troubles and worries are left on the mainland, Montecito lulls its inhabitants into a peaceful state of mind, which translates into being purely focused on enjoying some of life's genuine pleasures: ocean breezes, warm sunshine, good food, and fine wine. Celebrities, politicians, and giants of industry have turned to this quiet coastal community as a getaway for decades. 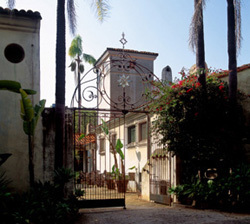 Charlie Chaplin built the Montecito Inn in 1927, where the guest list included such prestigious visitors as President and Mrs. John F. Kennedy, Laurence Olivier, and Winston Churchill. Today's celebrity Montecito real estate owners include a long list of notables in the entertainment, business and political world. They choose Montecito, of course, for its climate and rewarding lifestyle, but they continue to return because ours is one of the few communities where they can enjoy a 'normal' life without the concern and disturbance of fan recognition. Here they tend to be treated as just one of the neighbors. Gracious, luxurious living Montecito real estate includes an impressive array of estates, many of which were inspired by the stately homes of the south of France, Spain, and Italy – where the similar climate is due to our sharing one of the few east west shorelines in temperate latitudes. Admirers of Montecito real estate may mistake this lush, green enclave for the English countryside. A prestigious association, which has rejected incorporation as a town, Montecito is really a neighborhood of a different sort: a few square miles dotted by the most lavish estates in the world, a collection of stylish boutiques and welcoming cafes, the world famous Ganna Walska Lotusland private gardens, and a few hotels, one of which is the famed Santa Barbara Four Seasons Biltmore Hotel and another is the romantic San Ysidro Ranch, affiliated with Relais & Chateaux. 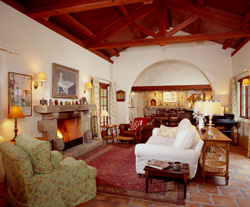 As a suburb of Santa Barbara, Montecito shares the temperate climate which has drawn so many people to the area. Located on the east side of Santa Barbara, Montecito extends about three miles eastward to Ortega Hill and Summerland and, on the other axis, from the ocean shore to the foothills of the Santa Ynez Mountains, a distance of about two miles. Montecito is an unincorporated section of Santa Barbara County, represented within the county government by The Montecito Association, a volunteer organization. Residents make up a population of some 9,000 people living in about 3,500 homes. Essentially a residential community, backed by a zoning ordinance created in 1930, there are, however, two shopping districts, several excellent public and private schools, a college, three country clubs, numerous restaurants and a handful of resort hotels in the community. In addition to The Montecito Association, other agencies supporting and regulating services in Montecito are The Montecito Fire Protection District, the Montecito Sanitary District, and the Montecito Water District. The origin of the name "Montecito" is unresolved but it has been applied to this area for slightly more than two centuries. Some attribute the name to the Spanish word for "little woods" while others say it means "little mountains." In either case, the name "Montecito" conjures all kinds of impressions. Some think that Montecito has always consisted of nothing but great estates with opulent gardens surrounding mansions filled with fine paintings, rare books, antique furniture and treasures from around the world. Such an impression is not entirely valid for even during the "Golden Age" of extensive estates there were many modest and small homes in Montecito. What is the special quality of Montecito? Perhaps the most distinguishing features are the tree and hedge-lined roads everywhere. While unity in architectural style forms a cohesive image in some cities, it is the landscape architects who assured the continuity of Montecito with the extensive planting of trees, flowers and shrubs. Residents of Montecito run the full range of economic wealth, starting with great riches and dropping down through affluence to modest incomes. Individuals in the community include those accomplished in the arts or with successful careers in education, government or in the corporate world. Wealthy residents of a half century ago were quick with pen and checkbook to the lasting benefit of Santa Barbara and the surrounding area and their presence attracted medical centers, cultural museums and performing arts of a higher caliber than the small town could otherwise support. It also brought fine stores and sporting clubs to Santa Barbara. The imported wealth provided livelihoods for artisans, domestics, gardeners and educators as well as bankers, lawyers, architects, brokers, real estate agents and the like. The way of life in Montecito is as varied as its people. Great parties and cultural entertainment amid well tended gardens have been characteristic of the community. In prior years, the large estates were open to the public joining scheduled Garden Tours. Some of the long-established patterns still prevail. A walk along Butterfly Beach and an ocean swim are still possible on an almost daily basis. For others, a drive along back roads or a hike along a creek bed in the foothills provides a relaxing afternoon. There are over a dozen excellent golf courses and tennis clubs in the area, and sailing and polo are year-round attractions.